March 14 (3.14) is Pi Day– how will you celebrate?! CUNY Tutor Corps is hiring full-time CUNY students for the spring semester! Do you want to earn $15/hour while contributing to STEM education in middle and high school classrooms? Apply today! Deadline is December 16, 2018. Last Chance to Apply for CUNY Tutor Corps! Tutor Corps is actively recruiting for the fall semester! We bring current CUNY students who are studying math, compsci, tech, and education into NYC public schools. $15 per hour – 12 hours per week. LINCT for All is expanding! In the 2018-2019 school year, LINCT plans to serve 4,000 students in roughly 100 schools, and we are hiring! Lessons in Navigating College Transitions (LINCT) is an academic college access program offered by CUNY, in partnership with the NYCDOE. Our goal is to reduce traditional barriers to success at CUNY by ensuring that students who graduate from NYC public high schools enter college academically eligible to take and succeed in credit-bearing courses. LINCT has two focus areas: Mathematics and English. CUNY LINCT staff work within CUNY’s Office of Academic Affairs in the division of K-16 Initiatives whose programs focus on helping NYC public school students make a successful transition to college, careers and beyond. We support the city’s commitment to equity by developing high quality transition programs that help eliminate achievement gaps between racial, ethnic, and socio-economic groups. Seven alumni of The City University of New York have won 2018 Big Apple Awards, a recognition of their exceptional skills as New York City public-school educators. The winners, announced by the New York City Department of Education, represent four colleges – Brooklyn College, City College, Hunter College and Queens College – and the CUNY Graduate Center. CUNY is well represented among the winners, with nearly half of the 17 awards coming from the University. The seven teachers who won were selected from a pool of more than 6,500 nominations, representing schools in all five boroughs. All will serve as Big Apple Fellows during the 2018-19 school year. One of these winners, Stephanie Flete, teaches fourth-grade Mathematics at Urban Scholars Community School in the Bronx and earned her B.S. at City College. Read CUNY’s entire News Release here! On May 31, 2018 Lehman College/CUNY celebrated its 50th Commencement, and Dr. Joseph Fera was acknowledged as the college’s Teacher of the Year during the ceremony. Dr. Fera serves as Assistant Professor in the Department of Mathematics at Lehman. As presider for Commencement, Dr. Fera infused his comments with some math humor, noting that as a mathematician he could recognize that the number 50 was a big deal! 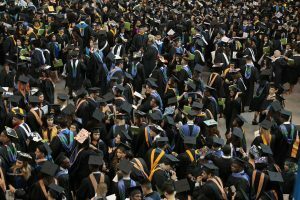 More than 3,400 Lehman students received degrees and certificates at the historic event. Congratulations to the graduates, and congratulations, Dr. Fera! March 14 is Pi Day! A day to celebrate this mathematical constant, the ratio of a circle’s circumference to its diameter, Pi Day is also a chance to make pi fun for students with activities, problems and even pi poems. Explore some resources and make 3.14 come alive. It’s also a great day to thank your favorite math teacher! If you were paying attention, there was plenty of math at the Winter Olympics in Pyeongchang, Korea, like the degrees attributed to rotations for skiers and snowboarders (think Chloe Kim’s 1080 spins) or the hundredth of a second margin in a biathlon finish. This fun piece on Alina Zagitova attributes her winning the gold medal in women’s figure skating to her mathematical calculations on the points attributed to jumps. The CUNY Math Challenge: Win up to $1,000! The CUNY Math Challenge aims to reward CUNY’s best math talent. Regardless of your major, if you are a CUNY undergraduate student and enjoy doing math problems, this contest is for you! The contest starts March 12, 2018 and finalists can win stipends up to $1,000! Registration is open until March 21.